Fill a tabletop fryer or deep Dutch oven with oil. If using a Dutch oven, fill 1 1/2-2 inches deep and heat over medium to medium-high heat. For tabletop fryers, pre-heat the oil to 365°F. Set up a breading station for meat: In separate shallow dishes, place 1 cup flour seasoned with salt and pepper, four eggs beaten and seasoned with salt and pepper and the breadcrumbs mixed with grated cheese. Pre-heat the oven to 250°F. Arrange a metal rack inserted into large baking sheet. Slice the chicken and pork on a bias into thin medallions. Season the chicken, pork and veal pieces with salt and pepper. Bread the meats in the flour, egg, then breadcrumbs, and fry in small batches to deep golden on both sides, about 3-4 minutes. Transfer to a baking sheet and keep warm in a low oven. Place the remaining 1 1/2 cups flour in a bowl and season with salt, pepper and nutmeg. Whisk in 2 eggs and seltzer to form a batter. Dip and fry the butternut squash, potatoes and mushrooms in small batches. Drain on parchment paper or a paper towel-lined platter and sprinkle with flaky sea salt while hot. Dip and flash-fry the spinach then the herbs; they will cook very quickly. 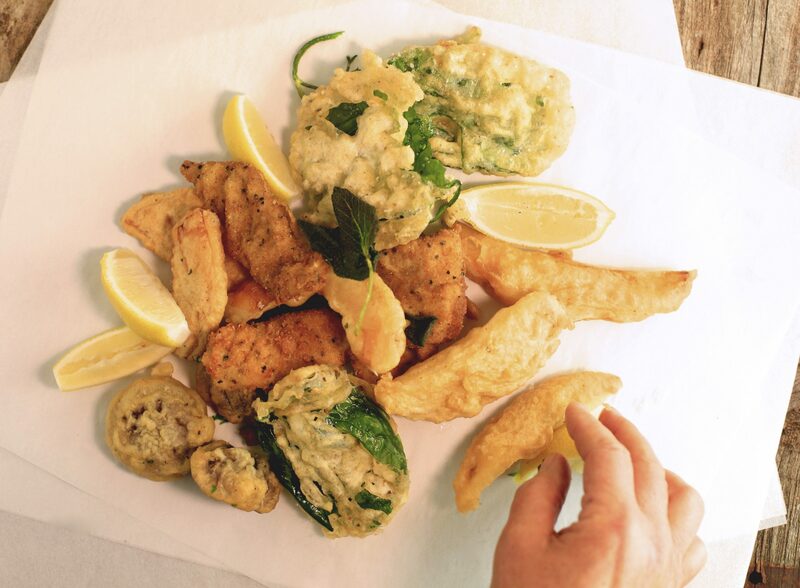 Serve the fried meats and vegetables, spinach and herbs on a platter with lemon wedges for dousing. In Recipes-list.com we have selected the most viewed recipes from category - uncategorized . Enjoy the best recipes specially selected for you! Autumn Frito Misto is the right choice that will satisfy all your claims.